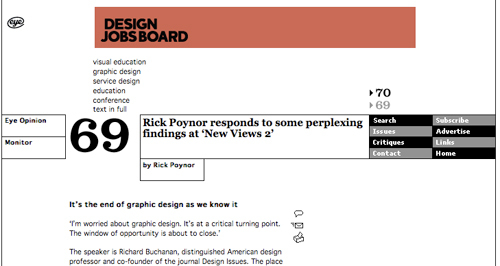 Above: Via Eye, Rick Poynor‘s, “It’s the end of graphic design as we know it.” A must-read ‘New Views 2′ review and discussion of Richard Buchanan‘s thoughts on contemporary graphic design issues. Previous: Apropos grids… tone poems of color. This entry was posted by Erik Brandt on Friday, December 5th, 2008 at 11:15 PM	and is filed under Aktuell, Education, Free Radicals, Globalization, Graphic Design, International, News Links, Typografika, Typography.